Are you planning a unicorn party for your little one and need some inspiration for party centerpieces? Well you’re in the right place with this Easy DIY Unicorn Centerpiece! Unicorns are all the rage right now. You can’t log into Pinterest without seeing at least a few unicorn crafts. You will find everything ranging from unicorn slime and desserts to unicorn decor and party favors. Since there are so many cute unicorn ideas out there, having a unicorn birthday party would be so much fun! There is an idea out there for every aspect of a unicorn themed party. Every party needs some amazing table centerpieces, so why not make these adorable unicorn centerpieces?! They are so easy and turn out cute every time. This project is so great because the centerpiece can be kept and later added to your child’s bedroom decor. Hang it on the wall or set it on a shelf. It will add so much personality to any little girl’s room! These unicorn party centerpieces can be made out of either letters or numbers and you can switch up the colors to match your party theme. The possibilities are endless! Learn How to Make DIY Unicorn Favor Boxes and these Easy Unicorn Poop Cookies for your party! This unicorn centerpiece might look professional, but anyone can make it. WOW your party guests by whipping up one or a few of these centerpieces to place around your unicorn birthday party! These unicorn party centerpieces not only look fabulous on guest tables, but you can display them on your unicorn dessert table, gift table, etc. 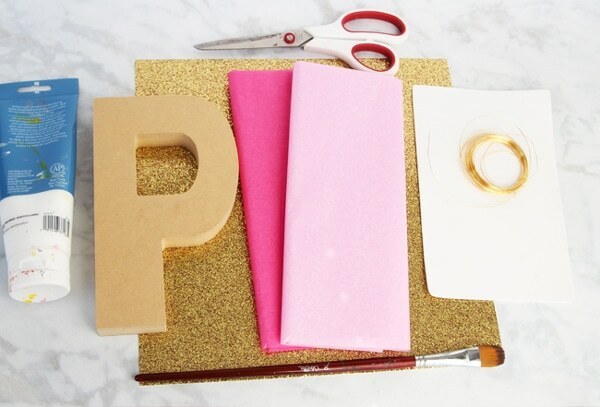 And if you’re looking for a fun party activity for the kids, have them make one of their very own using their initial of their first name! 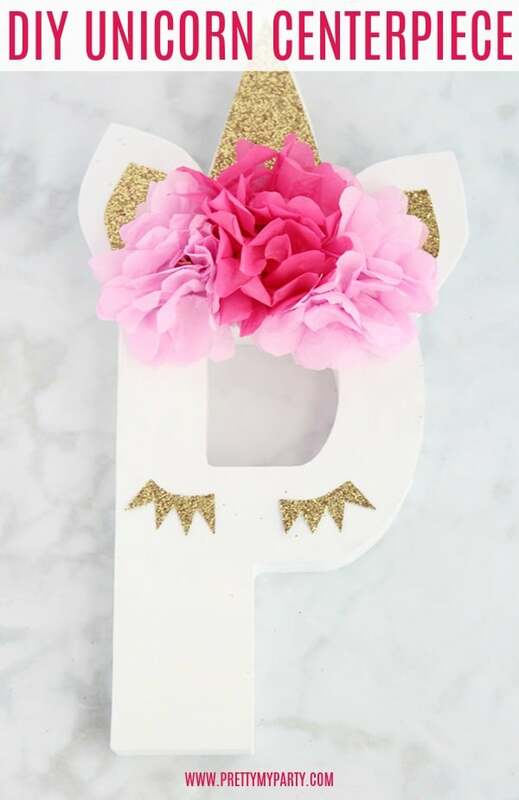 No matter which way you use this unicorn craft, you will certainly be getting a lot of complements on it! 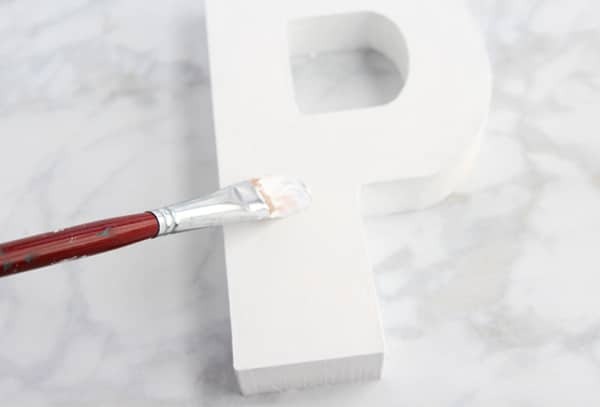 First, you will need to paint your letter or number with a few coats of white acrylic paint. 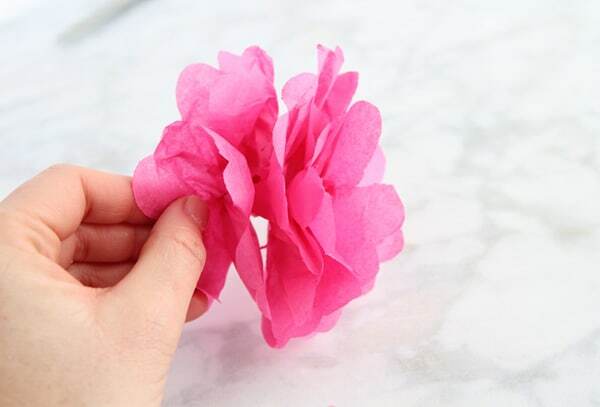 While the letter is drying, make your tissue paper flowers. Depending on the size of your letter, you can adjust the size of the flowers. Layer 4-5 sheets of tissue paper on top of each other. I made my sheets about 3X5 inches. Fold the sheets accordion style and trim off the edges to make them rounded. 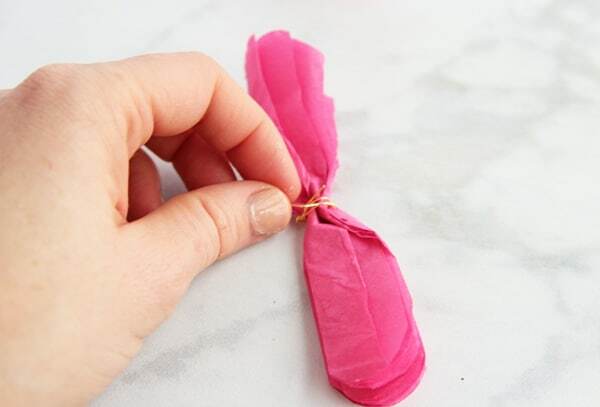 Pinch the center of the folded tissue paper and wrap some wire around it. Fan out each side of the tissue paper. 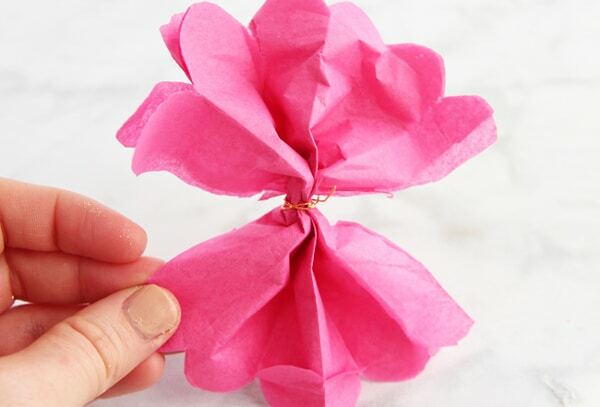 Carefully peel back each sheet of tissue paper, toward the center wire. 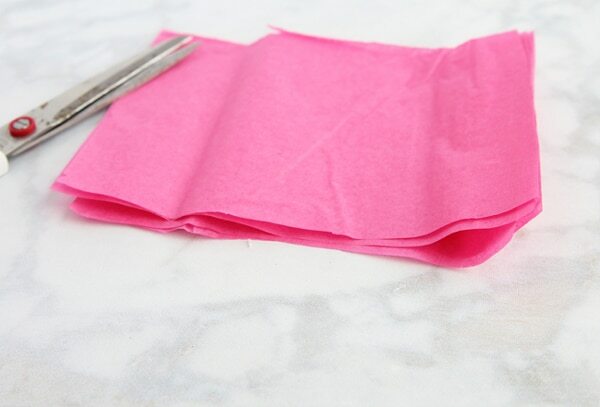 Keep fluffing the tissue paper until you have a flower. 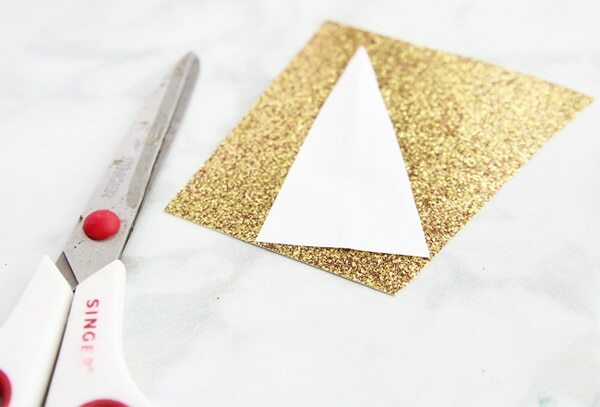 Next, cut out 2 triangle pieces of the glittery card stock. 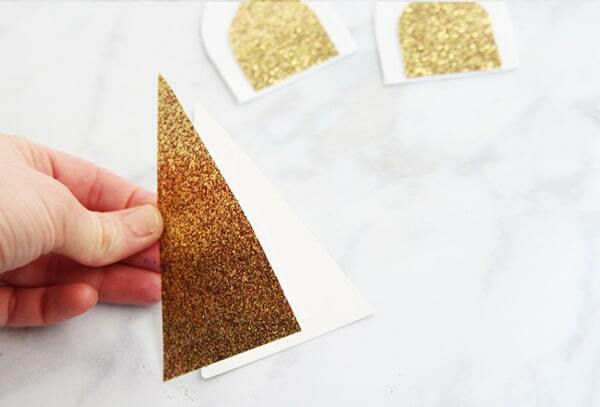 You will also want to cut out 2 eyelash shapes out of the glittery card stock. Using hot glue, attach the two triangle pieces, wrong sides together. 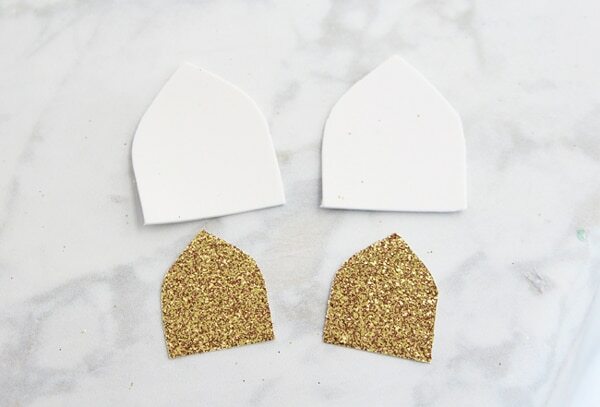 Cut ear shapes out of the white foam and 2 smaller ear shapes out of the glittery cardstock. 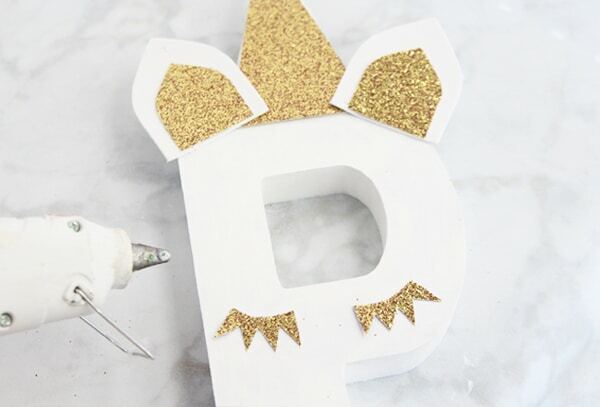 Glue the ears and triangle horn to the top of the letter. Glue the eyes on as well. 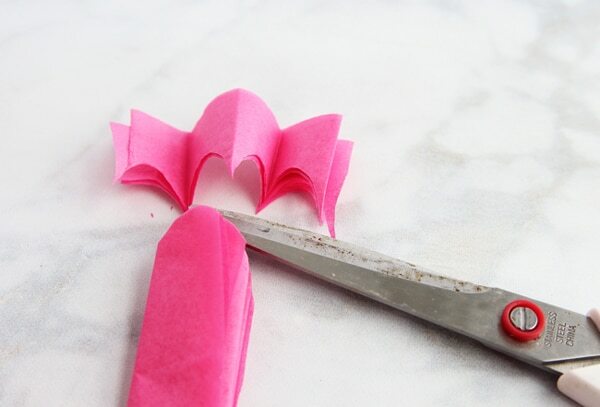 Lastly, attach the tissue paper flowers on the top of the letter in front of the ears and horn. 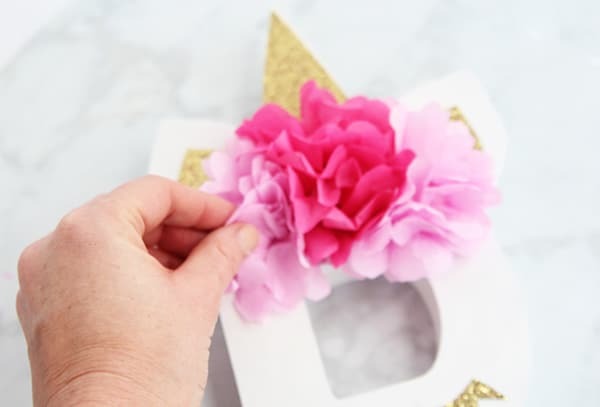 Everyone will agree that this is the cutest DIY unicorn centerpiece, perfect for any little girl’s unicorn party! What do you think of this Easy DIY Unicorn Centerpiece? 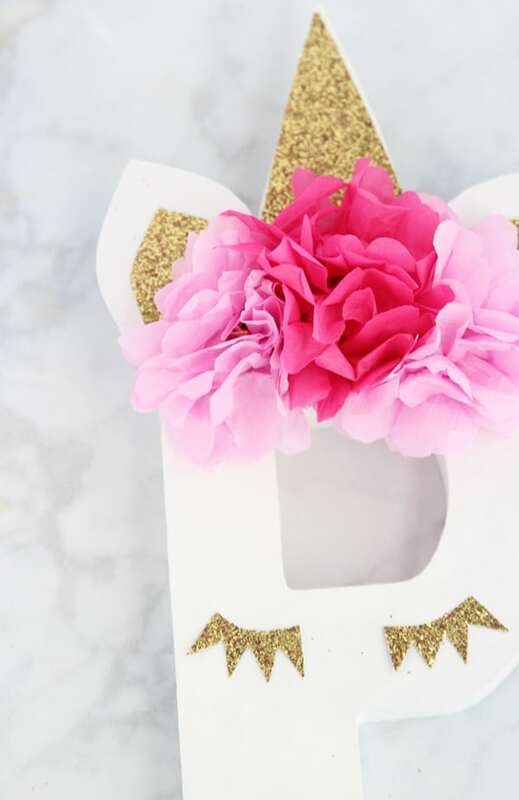 Is this a unicorn craft that you will attempt for your child’s unicorn party? Let us know in the comments below! 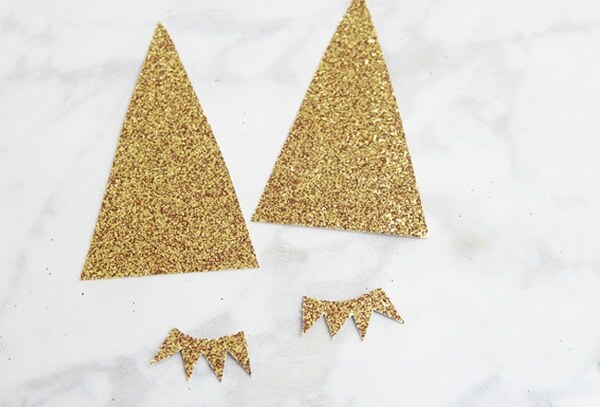 For more craft and party ideas, follow us on Instagram @prettymyparty and Pinterest and join us in our private Facebook group. I hope you enjoy this magical unicorn craft! 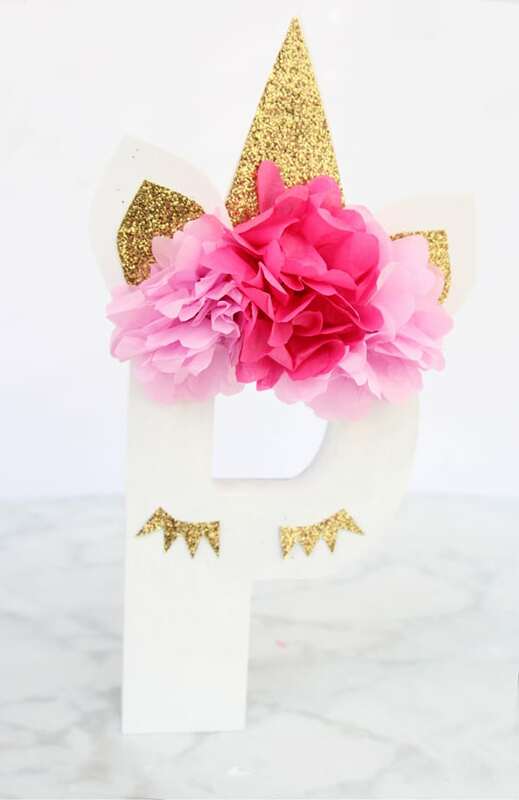 Be sure to tag us on Instagram @prettymyparty with the hashtag #prettymyparty and show off your DIY unicorn centerpiece for a chance to be featured on our Instagram! So cute! My daughter is a fan of all things unicorn so I know she’d love this. Thanks for sharing a great post. Pink is my and my daughter favorite color she is very happy to see your unicorn and craft images.